If you haven't played any of this series before, now's the time! The Legend of Heroes: Trails of Cold Steel is set to make a very big splash in the West with XSEED Games' upcoming special limited edition of the role-playing game. The "Lionheart Edition" was announced today prior to all of Apple's big news and will be available for both PlayStation 3 and PS Vita around the holiday season in North America. 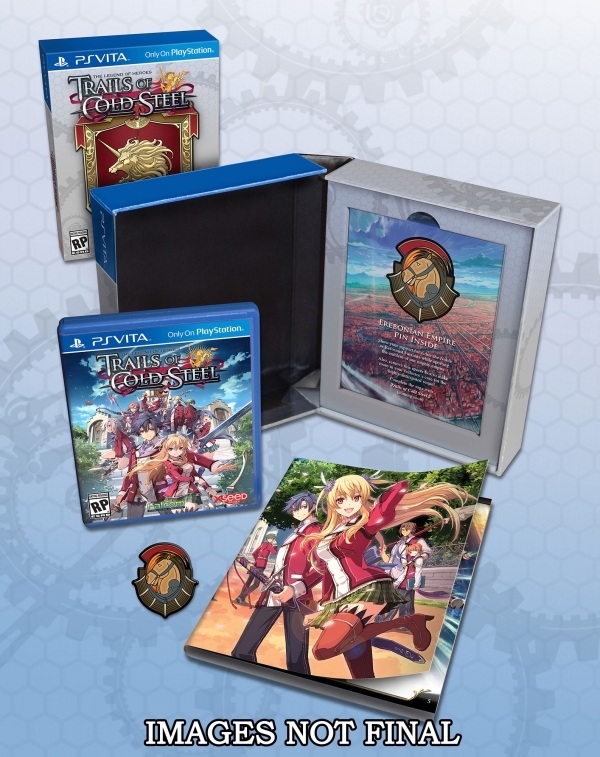 The special edition will include, of course, a copy of the game, a 100-page art book, a clamshell box that can hold both this game and its sequel when it's available in 2016, and a special pin with the emblem of the country Erebonia on it. The standard edition will be $39.99, but the Lionheart Edition will go for $49.99. This is the type of special edition that probably won't last very long as either a preorder or one that's readily available, so if you're looking to add this game to your collection, you'll definitely want to make sure you snap it up before it inevitably goes out of print.